Isolation in mid-Mediterranean has made Sardinia the most idiosyncratic of Italian regions. The island’s history has been influenced as much by foreigners, Spaniards in particular, as by other Italians. Sardinians have sharply reduced vineyards and volume of production recently while notably improving the general quality of their wines. The wooded slopes of the northern Gallura peninsula and the northwestern coastal area around Sassari and Alghero are noted for premium whites. Vermentino dominates the dry wines, notably in Vermentino di Gallura DOCG, though the Torbato under Alghero DOC can be equally impressive. Vermentino, a variety also planted in Liguria and parts of Tuscany, makes a white of winning style in the Gallura hills, though it can be produced throughout the region under the Sardinia DOC. The island’s important red varieties are Cannonau, a relative of the Granacha brought from Spain, and Carignano and Monica, also of Spanish origin. Cannonau and Monica can be dry or sweet, though trends favor the dry type toned down in strength from its traditionally heroic proportions. Vineyards in the rugged eastern coastal range around Nuoro are noted for rich, red Cannonau. Wines of note comes from the towns of Oliena, Jerzu and Dorgali and the coastal hills of Capo Ferrato. Cannonau also makes a fine sweet wine, which can be reminiscent of Port. The region ranks 3rd in size (24,090 square kilometers) and 12th in population (1,654,000). Sardegna’s average annual wine production of 930,000 hectoliters (14th in volume among the regions) includes more than 10% DOC/DOCG. 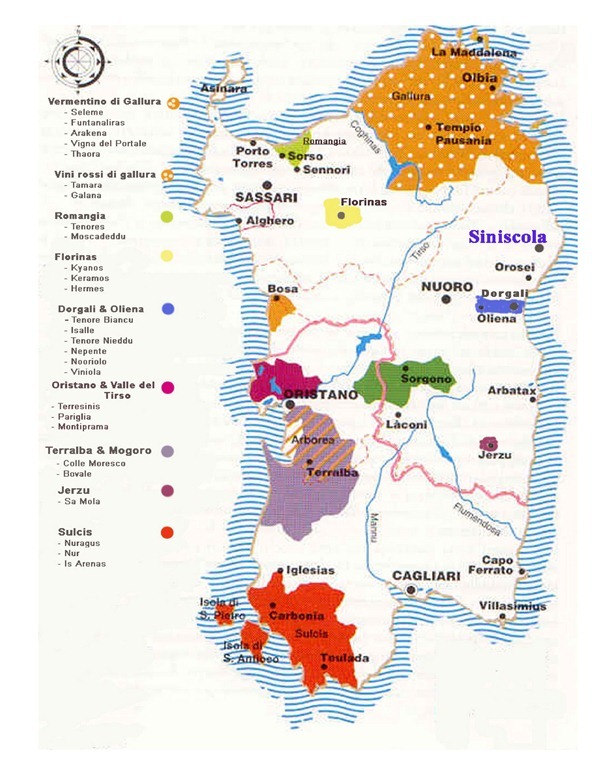 In addition to its 20 wines of DOC and DOCG, Sardinia has 15 IGTs, the most of any region. Production of red and white wine are about equally divided in Sardegna.